Established in 2003, KB Associates is an independent provider of management company and consulting services. We are dedicated exclusively to meeting the needs of asset managers establishing offshore investment funds. KB Associates works with a diverse range of asset managers enabling them to successfully develop their offshore funds businesses. KB Associates supports both traditional UCITS and alternative products across all leading offshore jurisdictions. The current business environment presents major challenges for asset managers operating offshore investment funds. Challenging markets demand that scarce management resources focus on generating additional revenues and minimising costs. Simultaneously there is a need to ensure that offshore funds operate in accordance with current best governance practices and that all compliance, operational, financial and reputational risks associated with such funds are properly managed. Not only is it necessary to enhance profitability while prudently managing risk but this must be achieved in an environment subject to ever increasing regulatory and product complexity. KB Associates offers a range of management company, compliance, risk management, operational and governance services enabling clients to focus their resources on developing new products and increasing profitability. Enabling clients to focus scarce management resources on developing new revenue streams and increasing profitability. 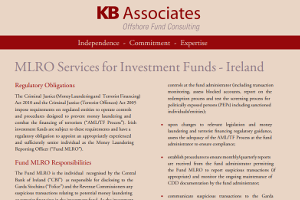 KB Associates has successfully advised asset managers on the establishment of funds in all major offshore fund jurisdictions, including Ireland, Luxembourg, Cayman, Bermuda, BVI and Mauritius. KB Associates utilises its expertise and experience to assist asset managers with this process and has advised on all fund types including UCITS, AIFs, ETFs, offshore hedge funds, fund of funds, private equity funds and property funds. Establishing funds offshore presents managers with numerous challenges. The selection of service providers, development of operational procedures, preparation of business plans/programmes of activity, risk management process documents and development of reporting processes are all items which must be addressed. KB Associates offers managers wishing to establish funds offshore, a turn-key project management solution. Investment funds operate in an ever more demanding regulatory environment. Asset managers and funds require expertise in the areas of operations, risk management and compliance oversight. The KB Associates team of consultants provides asset managers with real expertise in these areas. KB Associates enables funds to address complex regulatory challenges with minimal impact on the manager’s internal resources. The regulatory regime for investment funds structured as UCITS or subject to AIFMD requires the implementation of a detailed operational, risk and governance framework. 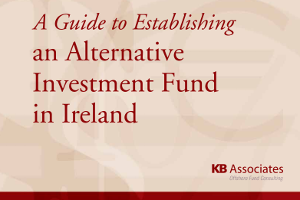 The business plan for UCITS funds and the corresponding programme of activity for Alternative Investment Funds describe how such funds must operate. KB Associates’ team of consultants conduct the detailed operations, risk and compliance oversight that is required. KB Associates’ appointment provides managers with access to both real expertise and significant cost savings. 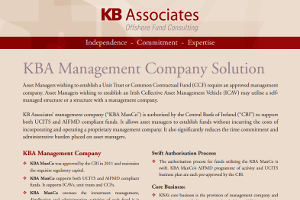 The management company is authorised by the Central Bank of Ireland and supports funds structured as unit trusts, common contractual funds and Irish Collective Asset-management Vehicles (ICAVs). The management company supports both UCITS and AIFMD compliant funds. An asset manager using the management company avoids both the costs and the risks associated with operating a subsidiary in an overseas jurisdiction. Where appointed, the management company assumes responsibility for all local regulatory and compliance requirements. Asset managers also free themselves from the requirement to set aside capital by utilising the management company. KB Associates assists asset managers with an extensive range of operational and compliance issues. 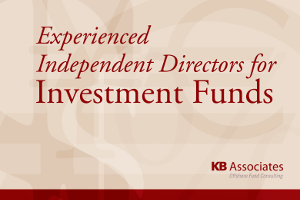 KB Associates’ independence and in-depth understanding of the capabilities of administrators, custodians and prime brokers ensures that expert advice is provided to managers seeking to identify the most appropriate service providers for a particular fund. Financial regulators continue to focus on money laundering and the possibility that investment funds may present opportunities for money launderers. KB Associates offers a specialist MLRO service to funds. This service operates independently of a regulated fund’s administrator/transfer agent. 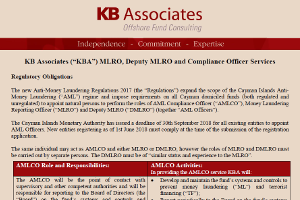 The MLRO monitors the administrator’s AML procedures, carries out on-site inspections, reviews the AML documentation on file, reports to the Board of the fund and provides AML training. The appointed MLRO is also responsible for reporting suspicious transactions to the relevant authorities. 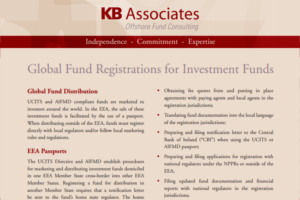 KB Associates uses its extensive expertise in this area to ensure that investment funds comply with all evolving AML requirements. 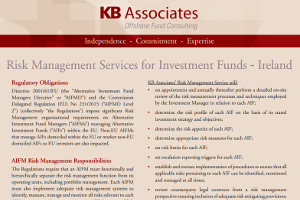 KB Associates provides a risk management service to AIFs enabling such funds to perform the risk management functions required to ensure compliance with AIFMD. KB Associates’ risk management service includes the performance of detailed on-site reviews of the risk management processes employed by AIFs’ investment managers, the determination of the risk profile and appetite of each AIF, the setting of risk limits for each AIF and the implementation of procedures to ensure that all applicable risks pertaining to each AIF can be identified and monitored. KB Associates also conducts periodic checks as to the validity of market risk exposure values reported by investment managers. KB Associates monitors compliance with all risk limits, reviews and approves all counterparties and provides risk management reports at each board meeting. Investment funds and management companies are increasingly required to appoint independent directors. Investors require directors to meet stringent standards with regard to both integrity and competence. KB Associates offers managers a highly experienced panel of non-executive directors who adhere to the highest standards of corporate governance and bring current industry expertise to those boards on which they serve. KB Associates’ directors provide complete transparency in respect of appointments, a factor which is viewed as increasingly important by investors. KB Associates offers this service to asset managers from our London office. KB Associates provides tailored assistance to start-up investment managers by addressing all operational, risk management and infrastructure issues necessary to ensure the successful establishment of the manager. KB Associates’ independence means we offer impartial advice as to the right service providers for a particular manager and fund structure. In order to attract investor capital both funds and asset managers must have the appropriate operational and compliance infrastructure in place to pass investor due diligence reviews. The focus of investor due diligence is evolving rapidly and it is imperative that proper procedures are in place. KB Associates critically reviews the operational infrastructure and processes along with the materials to be provided to potential investors in order to identify and rectify likely causes of investor concern. Consideration is given to a wide range of factors including risk management, governance, compliance and operational control. KB Associates, licensed in the Cayman Islands, provides independent director services, company registration services, registered office and company secretary services for Cayman domiciled funds and management companies. KB Associates provides a dedicated professional to provide a transparent and responsive service to a restricted number of clients. 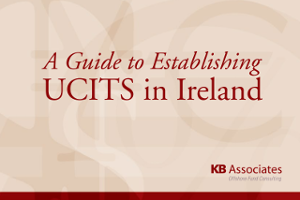 KB Associates provides a dedicated company secretary service to investment companies and management companies, both UCITS and non-UCITS in Ireland. 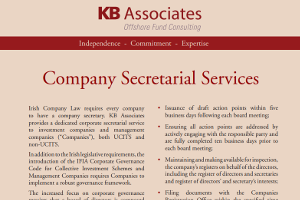 Company secretary services are also provided to funds in Cayman, Bermuda and other offshore jurisdictions. 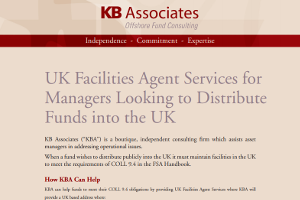 KB Associates provides a UK facilities agent service to funds distributing to the public in the UK. KB Associates offers a modular range of services which affords financial institutions the opportunity to more efficiently manage their offshore funds thus enabling critical management resources to focus on developing profit enhancing initiatives. KB Associates is an employee-owned independent consulting firm. 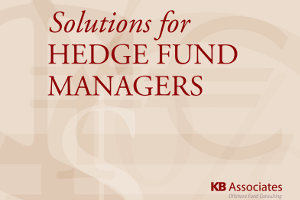 KB Associates offers its services only to asset managers. This avoids the conflicts of interest which would arise if KB Associates was to offer its services to the administrator/custodian community. Recognising the need to commit substantial time and resources to each client, KB Associates limits the number of client relationships for which each consultant is responsible. This means that each consultant has the time to develop a thorough understanding of the requirements of the managers for which he or she is responsible. All KB Associates’ consultants are professionally qualified with an average of fifteen years’ experience in the industry. All have held senior management positions with leading investment managers, custodians, fund administrators, audit firms, legal firms and prime brokers. This experience is critical to the provision of services to our clients. KB Associates’ commitment to training and professional development ensures that it attracts and retains leading industry experts. 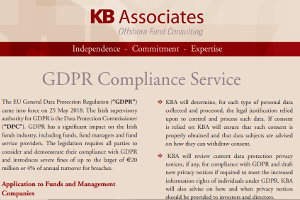 KB Associates is focused exclusively on assisting asset managers by addressing the governance, operational, risk and compliance issues relevant to the establishment and operation of offshore investment funds. All directors and shareholders of KB Associates are directly involved in delivering these services to our clients. Enabling clients to focus critical management resources on developing new revenue streams and enhancing profitability.